My (slightly altered) plate of biscuits made with the recipe from The Antebellum Inn. The orange grapefruit lemon marmalade is from a wonderful bakery in Atlanta called Alon’s. 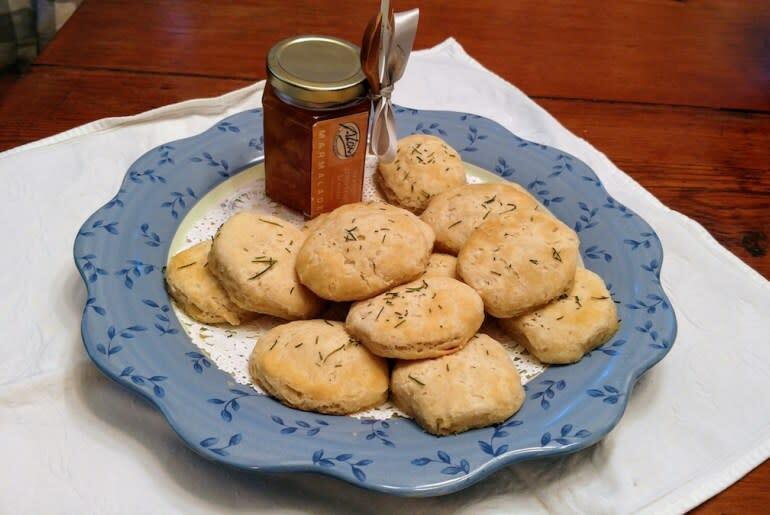 When the innkeeper at The Antebellum Inn agreed to share the inn’s biscuit recipe with me, I was so excited. I’ve long been on the hunt for a wonderful recipe. I love biscuits, and being southern-born, have eaten my weight in the flaky mounds of deliciousness many times over. That could be one of the reasons I was “pleasingly plump” as a child, although I never saw any benefit to dwelling on that, other than to occasionally offer thanks for the lack of much photographic evidence. But so often that golden brown baked dough doesn’t live up to its promise. I’ve sampled so many dry, tasteless, flavorless biscuits and have put down my fork in disappointment. Yes, I saved the calories, but nothing beats a warm biscuit with melted butter and homemade jam on top. When I first saw the curved mounds with an herb sprinkled on top on the sideboard at breakfast one morning at the inn, I wasn’t sure what they were. Scones, perhaps? Being a culinary adventuress as long as the item I’m about to eat has no moving parts or staring eyeballs, I happily stacked one on my plate. True to her promised she came and motioned for me to follow her into the kitchen. As I saw the dozens of dishes stacked up and gave silent thanks I wasn’t on clean-up duty, she began digging around on the counters. She finally went over to the trash and triumphantly pulled out an empty wrapper. She pointed at it and said, “Here’s my secret recipe. Be sure to get the butter tasting kind.” She was pointing to a bag of Mary B’s Butter Taste Biscuits. Was I disappointed? Heck, no! I was thrilled to learn the “secret” was that easy. No messy bags of flour. No rolling pins or biscuit cutters to clean. The biscuits were not only yummy, they couldn’t be easier to make. I wasn’t able to find the butter taste biscuits, so I used the thin version and they turned out just as delicious, but without the nice rounded top. I can’t grow fresh rosemary because we have no sun, but my neighbor’s mailbox has a large bush around it, so I snip a few springs off her bush when needed. Thanks, Jean. So there you have it. The easiest, best biscuit recipe in the world.